Avail our hotel booking services and make your lodging safe and comfortable around the nation. With our services, we can easily provide confirm status of booking for any number of rooms, even in the busiest days of the year. 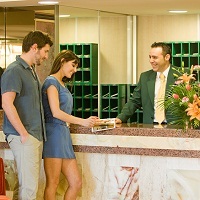 Owing to our allies with reputed hoteliers, we can arrange personalized amenities and room facilities. All you need to share is your basic requirements with check in and check out dates; rest will be managed by Life Travels Booking. We are based in Nanded (Maharashtra, India); clients can approach us for booking room(s) in the followings: 5 Star Hotels, 3 Star Hotels, 2 Star Hotels.